By now, this is quite an old camera, but it is still better spec'ed than many new budget cameras. In 2001, when it was new, it cost a lot of money, but the image quality then (and now) is very good and the 2MP resolution was cutting edge technology at the time. Outwardly, the DC280 is quite nicely styled, and although mainly plastic, it doesn't look like it will fall apart in a hurry. It handles well, feels good and solid in your hands, and is similar to a 35mm compact to hold, though slightly heavier due to the 4 AA cells (The fact that the camera takes AA's is very useful, as if your rechargables run flat, you can buy a set of alkalines from the nearest shop - something you can't do with custom batteries found in some cameras). The camera has two LCD displays, a color TFT monitor and a segment-type LCD panel. The panel displays useful information, like the approx. number of shots remaining on the card, the flash and mode settings, and the battery status. The TFT display is clear and reasonably bright, though it can be difficult to see in bright conditions. There is as contrast adjustment wheel on the base of the camera, just under the display. The menu system is clear and well thought out. There are a surprising number of options available through the menus, from EV compensation and white-balance to being able to customise the power-on settings of the camera. Compared to more modern cameras, these seem rather hidden away, but most people are unlikely to want these on a day to day basis. Rather than one of those flimsy automatically retracting lens covers, the DC280 has a traditional lens cover which is simply wedged gently in place. When the camera powers up, the lens pushes the lens cap off easily, putting an end to those embarassing shots of a black cat in a coal bunker! 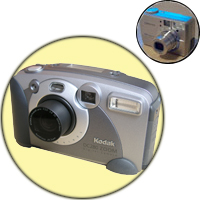 The camera comes with two PC connection leads, one which connects via a serial port and the other which connects via the USB port. Whilst the serial connection is very slow, it is not un-usable it is of benefit to people with older computers which don't have USB ports, or whose OS doesn't support USB (like Windows 95 and NT). There is also an S-Video out port, which allows the contents of the CF card to be displayed as a slideshow on a TV set. The bundled software is okay. Adobe PhotoDeluxe is now pretty dated and not enormously useful, but the camera connection software (for pre-Windows 2K/XP) has the added benefit of being able to remote control the camera. Windows XP recognises the camera as just another flash card reader, so you can't use the remote control feature. For Linux buffs, you will be pleased to hear that the DC280 has been supported for a long time and packages like gphoto can communicate directly with it. Perhaps dues to its age, the DC280 is rather heavy on the power and drains the cells quite quickly. This can be minimised be setting the power-save options on the camera and keeping the LCD display off as much as possible (this is true of all digital cameras, but is especially important here). One annoying trait is that there is quite a lag between pressing the shutter and the picture being taken. The auto-focus system is quite slow, so to get around this, pre-focus by half pressing the shutter before taking the shot. Another little trait of the auto-focus system is that it seems to go awry when presented with landscapes, especially if the zoom is used at all. The way around this is to put the camera into landscape mode to take the picture. The sensor in the DC280 is now rather dated, and is slower than its more modern counterparts. This is not usually a problem, but in low light, or if the zoom is used (especially on macro), the shutter speeds are much to slow to hand hold, thus giving rise to that age old preoblem of camera-shake. This can be avoided by using a tripod, and the camera has a standard tripod thread on the bottom. If you use a tripod indoors, without the flash, the results are surprisingly good, and look much more natural. I have been very happy with my DC280 for the time I have owned it and it was the desire for more megapixels and a more sophisticated camera with shutter- and aperture-priority that prompted me to change. It should now be possible to pick one of these cameras up second hand quite cheaply and you will still be getting a decent camera. Mine has been passed on to another family member.